Be our guest and join us for our Sunday brunch buffet, and burlesque. 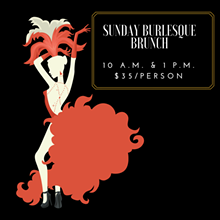 Two seatings available at 10 A.M. and 1 P.M. $35/person for brunch and the show. Join us for a brunch like no other.